With only about 5 weeks left until Baby E’s due date, I’m feeling the pressure to get the rocking chair finished in time. Even though I was tired after work, I decided to get in the shop this week for a couple late night work sessions. It made for some rough mornings, but I’m happy with what I was able to get done. The back splats needed the edges rounded over to take them from simple squares to smooth oval shapes. 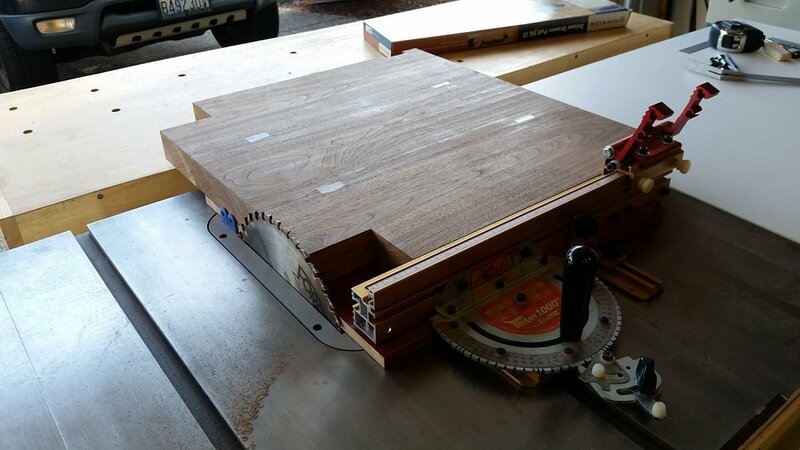 Since each splat is made from three laminated 1/8″ thick strips of wood, I used a 3/16″ round over router bit to round over all 4 corners of each splat. Here's an end view of the first splat with all 4 edges rounded over. All 6 splats with all edges rounded over. It’s crazy how some simple round-overs really transform the look of the splats. Rounding the edges also makes it very difficult to tell that each splat is actually made up of multiple thin strips of wood. Now that I had oval shaped splats, I needed oval shaped mortises to put them in. The back edge of the seat slab was slightly uneven, so it needed to a slight trim to square things up, prior to doing the layout for the mortises. Here are all 6 splat mortises marked out on the seat slab. I took some extra time to mark the waste areas to make it very clear where each cut needed to be made. No sense in rushing and making a stupid mistake now. 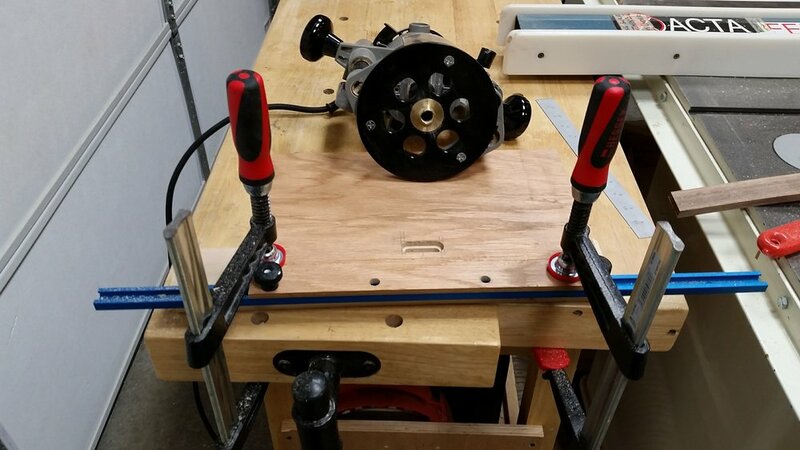 I needed a way to cut the mortises consistently and evenly, so I used a scrap piece of 1/4″ plywood to make a simple mortising jig. 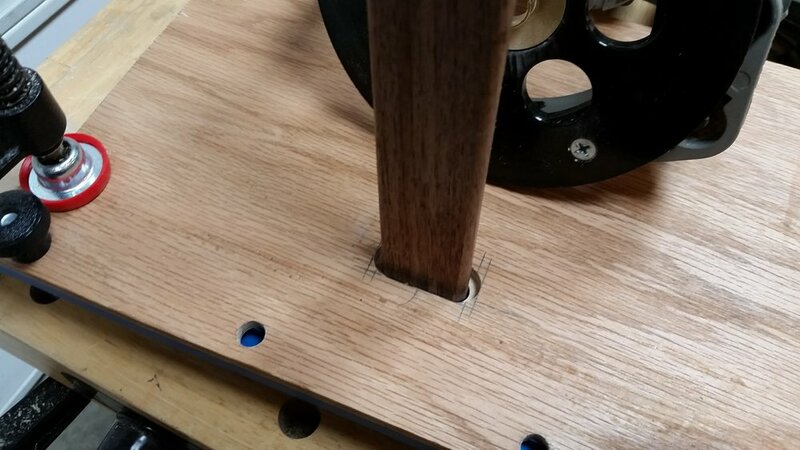 Some overlapping cuts with a forstner bit created a perfectly sized slot for the router bushing to ride in. 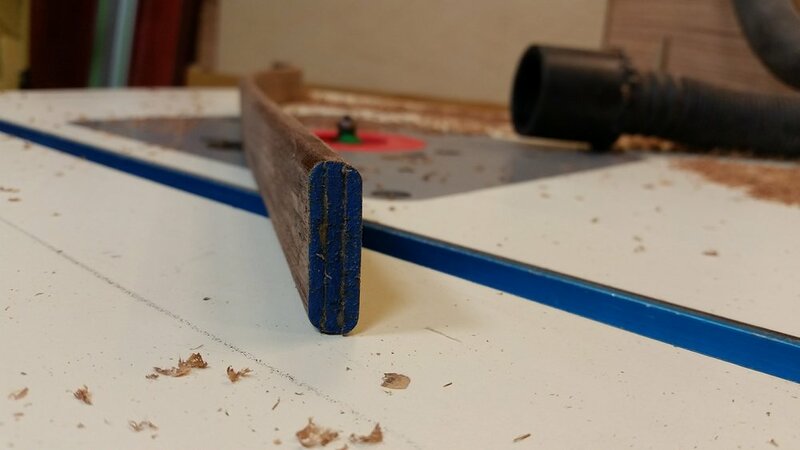 I added a piece of T-track on the edge of the jig to act as a fence. This locates the slot the correct distance from the back edge of the seat slab. After making a few test cuts on a scrap piece of wood with a 3/8" spiral down-cut bit, I had the jig fine-tuned to cut mortises that are exactly 1 3/8" wide. This just so happens to be the width of each splat. Go figure, right? Turns out it’s a good thing that I made some test cuts before attempting to cut the seat slab. Let’s just say that the first test cut (far right) did NOT go well! After a little practice on the scrap piece, I had a mortise that the splat fit into, nice and tight. It was now time for the real deal. All 6 mortises cut into the seat slab. The jig worked perfectly! Each mortise is just the right size and evenly spaced. I’ll use the same jig when it comes time to cut the mortises in the bottom edge of the headrest. First test fit of the back splats into the seat slab. I'll still need to trim the splats to the proper length, but this gives a general idea of how they will look in the finished chair. When I finished cutting all six mortises, it was nearly midnight, but I couldn’t resist the urge to do another dry clamp-up to see all of the parts together. It’s looking more and more like a legitimate piece of furniture every day now and it feels like the finish line is somewhat in sight. I’m not sure if late night work sessions are the best solution, but sometimes you just have to get it done. The late nights really did make for some rough mornings, but it was worth it to keep the progress moving forward. At this point, I can no longer put off the daunting task of carving the seat slab. I plan to dive into the carving full force this weekend, so wish me luck!